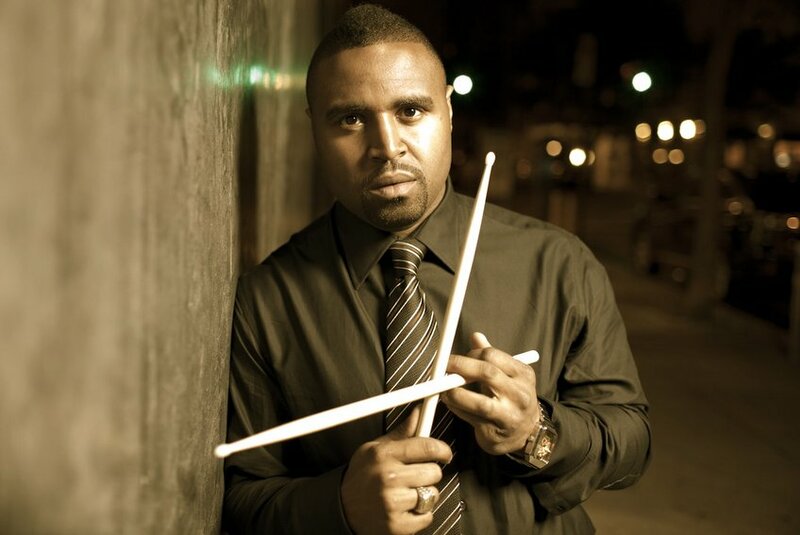 “Love will be in the air,” at Cullen Performance Hall on February 14, says drummer Kendrick Scott. That’s when jazz legend Charles Lloyd and the Marvels will perform as part of Da Camera’s popular jazz series. Lloyd, a saxophonist whose musical career has spanned 70 years, is a National Endowment for the Arts Jazz Master known for threading complex, dynamic musical ideas into the most elemental and open-hearted of riffs and melodies. The mood will be celebratory for all, but for drummer Kendrick Scott, the celebration is about more than just the music. This performance will serve as a homecoming for Scott, a Houston native who was first introduced to music at church, where his parents served in the music ministry. As a teen, he attended Houston’s High School for the Performing and Visual Arts, where he learned from musical giants including Jason Moran, Chris Dave and the legendary Robert “Doc” Morgan before earning a scholarship to attend the illustrious Berklee College of Music in 1998. Since graduating, Scott has performed alongside major jazz figures including Dianne Reeves, Terence Blanchard and Lloyd, in addition to fronting his own group, Kendrick Scott Oracle (which appeared on Da Camera’s jazz series in 2015), and founding the World Culture Music label. What is it like performing alongside Charles Lloyd? It’s a dream come true for me to be around someone who’s so connected to so much of what jazz history is. I can feel the lineage in his playing, but I mostly feel that his voice comes through the horn. His spirit permeates the instrument in a way that is so authentic that it brings that out of you as an instrumentalist when you play with him. It takes you to another level. I think that’s what the beauty of Charles Lloyd is—he makes you enter that space, as well. That’s what I think the audience gets out of it, too. It’s a real invitation, the way he invites you into the space with him. As a native Houstonian, how does it feel to come home and perform for the city that gave you your musical foundation? It’s almost heavy sometimes. There’s a rich history in Houston, and I want to keep that going. It’s a pleasure and an honor to be included in that history. Wanting to live up to that is a little daunting sometimes when I think about all the great musicians from Houston that have influenced me and given me a chance to play. It’s always great to come home and play for family and close friends and people that I’ve known all my life. What should people expect, considering that the performance is Feb. 14, which is Valentine’s Day? Love will be in the air, that’s for sure. Charles plays with a sense of love and a sense of invitation. This band has a lot of ethereal sounds, a lot of grit, a lot of soul and a lot of beauty; there’s so many characters in Charles’s music. I think people should be excited to be invited into the space, because it’s kind of indescribable. Charles’s influence spans the gamut of American music. You might have a feeling one night, and another night there’s another feeling. You have to be there to experience it, because he’s a sage. What’s favorite part of the program? I really don’t have a favorite, crazy enough. The whole thing is, for me, the pinnacle of what jazz is. Jazz and life, whatever, it’s about the process. The process of going onstage and being around Charles is the actual joy for me, so it doesn’t matter what we play. And, to be honest with you, I don’t think we all know what we’re going to play. It’s the process of it, the beauty of improvisation, living in the moment and embracing that uncertainty. That’s why I think Charles is such a great human being. He takes everything as it is in the moment. He’ll get to Houston and he’s going to feel out what it feels like to be in that space, in that moment, and find something to play. I’m more about being in that moment with him. The actual songs, they’re great, they’re incredible, but the process is the most important thing for me. With such a hectic travel schedule, how do you keep yourself artistically fresh? I have to be around forward-thinking people, like Jason Moran and Chris Dave, both people from Houston. People from other walks of life who are also pushing boundaries and thinking critically, thinking about social issues, thinking about things outside of their field, pushing themselves to attain a higher level of thought and a deeper meaning of life. When I’m not traveling and playing, I’m seeking those people out. What’s one thing about your drum setup that most people would be surprised to learn? I have a snare drum that I play with my left foot. That’s pretty weird. You first got into music because your family was involved in the music ministry of your church in Houston. What attracted you to the drums? I don’t know what attracted me to them, it was just meant to be, I think. They chose me. The first memories I have are going up and being totally mystified by them. The piano and the drums were very close to each other, so I would go up to be with my mother, who played the piano, but I ended up going to the drums every time, just watching and just looking at them. I always thought they were the most beautiful thing ever, aesthetically. I always thought they had some type of primal element to them, which they do. Drums are so interesting because they can be so beautiful, but they can also be so cathartic. They’re like therapy. As a young kid, I needed some of that, and I still do. They’re great therapy for me. What are your most cherished memories from your time at the High School for the Performing and Visual Arts (HSPVA)? The laughs that we had were some of the greatest ever. From my time, having Walter Smith III and Robert Glasper in the band room together was hilarious. All of those things add to the music. When you see everybody’s personalities start to show inside of their music, I think that’s the highest form of authenticity. And now to see the world embracing those personalities, that, to me, is the pinnacle. The laughs were incredible, and, also the level of commitment that we had at a young age. That’s still happening now, as I just went back during the holidays, the level of commitment is the most amazing thing that I remember, too, across all our areas at HSPVA. I hope people will keep supporting HSPVA and music education across Houston in schools other than HSPVA because it’s very important that we support the arts. How did HSPVA help shape who you are as a musician? Doc Morgan knew how to pull out the best in us. He used discipline and love in a certain way where he showed us how you can draw a line between discipline and love. He started out with discipline and showed us that the more and more you understand it, if you do these things out of love, you won’t have to think about discipline. As a musician, and in life in general, that was huge lesson for me. Practicing my instrument, of course, was a discipline thing, like “Ok, you gotta practice.” After a while I started realizing, “No, I love doing this. That’s why I do it.” It was a huge revelation for me, and Doc Morgan was part of that process. I carry that through my whole life now and Doc was a big part of that, in how he taught and how he pulled the best out of us.